Disclaimer: I have been a friend of the Pit Barrel Cooker company for a few years now. Now they have an affiliate program where I can make a few bucks if you buy your Pit Barrel through this link: Buy a Pit Barrel Cooker here. 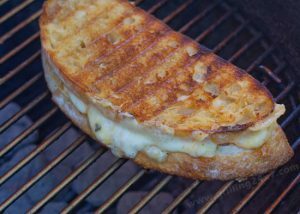 Buying your PBC through this link is no extra cost to you but it gives me a few bucks for typing all this stuff up and running the blog. Also, the PBC company makes more profit if you buy directly through them, vs buying it through Amazon or another company. If you like what I have presented here, please buy through this link. And certainly I stand behind this product. If it was garbage I would not be discussing it so highly. It’s a great product and a great company. If I had to change one thing about the Pit Barrel Cooker it would be that I would like a way to shut down the cooker afterwards and not have to wait for the charcoal fire to slowly burn out. With other types of smokers and grills you can close the air intakes and snuff out the charcoal fire. However, the air intake of the Pit Barrel doesn’t completely close. Also, the small holes that hold the rebar also remain open. This means that the fire can take a few hours to put itself out. Most of the time there is no problem at all with this. But what if you have a massive thunderstorm coming? 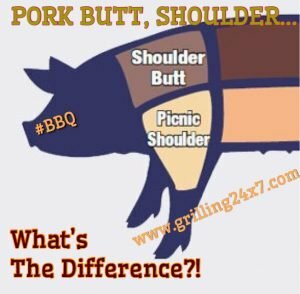 I wondered how to put the fire out in the Pit Barrel Cooker? Coming from the Ugly Drum Smoker school of thought, I decided to be ugly and grab 5 small pieces of aluminum foil. Each can be rolled and finagled into the air intake and all four of the rebar holes. 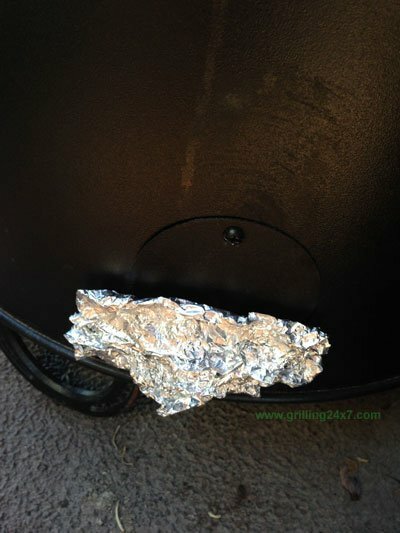 Make sure each piece of foil is inserted tight and within an hour or so your Pit Barrel Cooker will be cool to the touch. You will also save majority of your charcoal so you can use it again for the next cook. Since both the Weber Smokey Mountain and the Ugly Drum Smokers can be shut down in this fashion, I can’t see why there would be any problems doing this in the Pit Barrel Cooker. I did notice that the inside gets a little more “gunked up” but that makes sense considering you are snuffing out a fire and sequestering a bunch of smoke in the process of putting out the charcoal. After an hour I open up the smoker and let it air out a little, then pack it up for the night. So far so good. 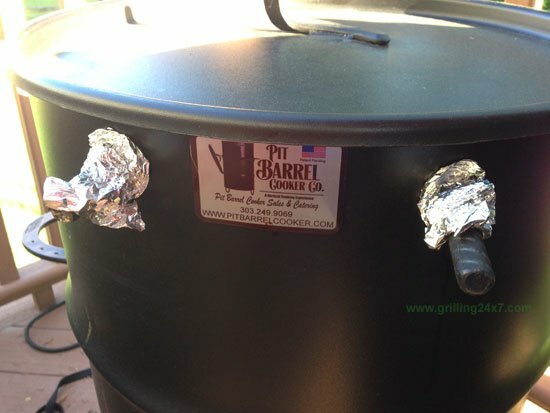 Check out my original Pit Barrel Cooker Review to learn more about the PBC. 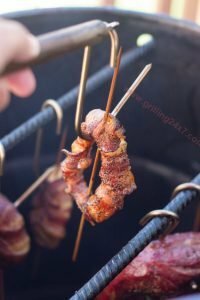 I also smoked bacon wrapped onion rings and tri-tip on the Pit Barrel Cooker. Check it out! Do not bother putting the coal basket fire out inside the pit barrel cooker. As mentioned it just creates a buildup in the cooker. Buy yourself a 10 gallon galvanized metal bin with locking lid. One that locks tight like those used for storing feed for animals. With gloves or hooks remove the coal basket from the PBC and insert it into the big and put the lid on. The oxygen will be deprived and the coals will go out. I noticed the stainless coal tray accessory for the coal basket is cut to a bigger diameter than the coal basket and won’t fit in the bin if still attached to simply rest it on the ground give the coal basket a simple twist to sperate it and then or the coal basket in the bin. Better yet get yourself two, one for print out coal basket fire and the second to fill with spent ashes until you get a chance to take it to the main rubbish bin for disposal. Where might I find one of these..? It sounds like a good way to collect ashes from my PBC and Fireplace as well.